UPDATE (2012.01.24): I received some explanations from AMD: the performance improvement in tessellation is generic for applications with large tessellation factors (read greater than 16, the max being 64) but is not necessarily optimal for more reasonnable settings (like X8). 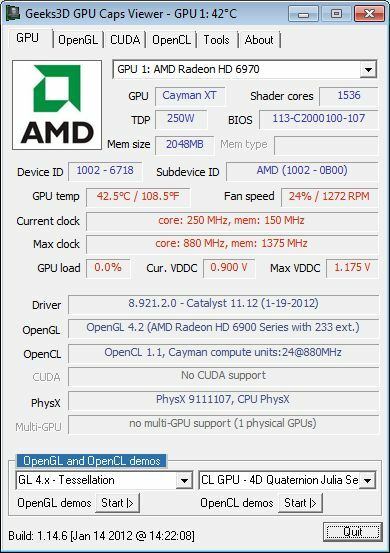 That’s why AMD decided to enable the performance improvement on a per application basis. I added a score with TessMark renamed in toto.exe to show the difference between the performance improvement enabled and disabled. You can download Catalyst 8.921.2 RC11 for Radeon HD 7900 HERE. The optimization is application specific profiling in the driver. Possibly removed some dead code/unneeded variables? 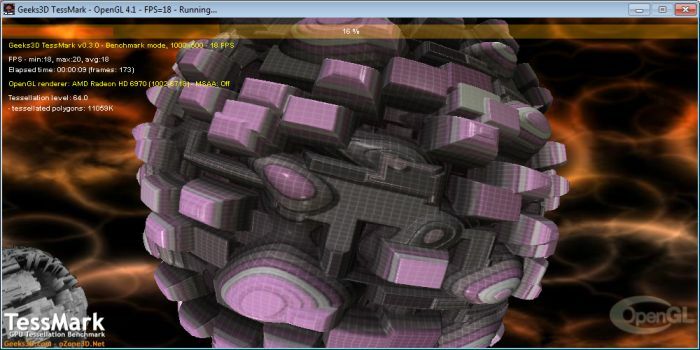 JeGX, what happens if you tweak the shader code slightly so the hash changes, do the performance boosts remain? It is a bit unfortunate if they are application specific tweaks, just means that they are expecting NVIDIA’s new hardware to be a lot faster. Shouldn’t they enable it then on a tessellation factor basis? And if the switching for each draw command is too high, they should/could perhaps accumulate the average tess. factor of the running app and use that instead. Binary name hacks are so ’90s. Tessellation factor can be computed dynamically in the shader. Every patch can have different tessellation factor. What you suggest would kill any performance benefit. Sure the shader can override it, but everything is better than a binary name detection. Yes I know about those commands but your solution just wouldn’t work. In many cases it would decrease performance because default tessellation factor would be completely different than the real one set by the shader. I agree that binary name detection is ugly hack but at least it works. Still the GPU (& its driver) should know the size of the current tessellation buffer and how often the buffer is too small to hold additional vertices (I assume this is what they optimized), cause it needs handle this case either by resizing the buffer or by pushing the current content further down the shader queue to make free space for the remaining vertices. In both cases I would assume that somewhere in the silicon this must either touch software/microcodes or it sets performance counters. And so the gfx drivers should be able to detect at runtime if it’s advisable to increase the default tessellation buffer size for the current program. Still those are just assumptions, never the less it’s already hard enough to find the `fastpath` with current gfx drivers, and such things don’t make it easier. Neither do I think things like this makes maintaining the driver’s codebase easier, or do they run an artificial neural network or a genetic algorithm on their settings to find the optimum for a new app? Don’t understand me wrong I don’t blame anyone, it’s just small part from an (non-end-)user’s perspective, who want that the driver works w/o support by the vendor, not less.